When a druid has lived for two thousand years like Atticus, he's bound to run afoul of a few vampires. Make that legions of them. Even his former friend and legal counsel turned out to be a bloodsucking backstabber. Now the toothy troublemakers—led by power-mad pain-in-the-neck Theophilus—have become a huge problem requiring a solution. It's time to make a stand. As Atticus globetrots to stop his nemesis Theophilus, the journey leads to Rome. What better place to end an immortal than the Eternal City? But poetic justice won't come without a price: In order to defeat Theophilus, Atticus may have to lose an old friend. I remember when I started this series and I couldn't get enough of it. I loved the Iron Druid Chronicles so much that I believe I even binge listened to them. So when I got to the last installment that was available I waited for the next part and it was a really long wait. I read somewhere that the next book was going to take a little longer than usual but waited patiently to hear something. So imagine my surprise when I came across this new installment last week. Totally by accident. Amazon and Audible didn't even recommend it to me and it has been out since January! I couldn't wait to listen to it. Since the series started this have grown so much that the books started to be narrated by three different druids. Now at first I forgot about this and when Granuaile took over it totally confused me and I have to start that chapter again. However when I got back into this I remembered most of what happened in the previous books and caught up. There was the same witty banter, fun characters and very magical storyline. Everything was there that I expected and I enjoyed the book until the end. However I have to say there were certain parts of the book that made me zone out a little. The narrator is amazing but I am not one for fighting and action scenes and even though he does a great job bringing them to life I just couldn't keep up with that aspect of the story. The rest was great but the battles and fights just kind of washed over me and I was only interested in the result. 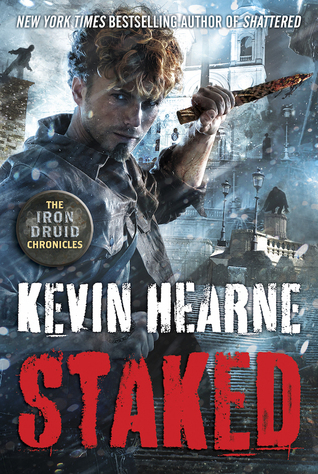 Staked ended like it was the end of the series. I haven't looked this up but despite enjoying the series a lot I wouldn't be too sad if this book was indeed the last installment. It has been a hell of a ride but I feel like the druids need a break. So much has happened and it is time for them to have some rest. Great series, unusual and unique. One that I would also re-read at some point but definitely one to listen to on audio. Great narrator and well worth listening to. This isn't the last one. There is defiantly at least one more book coming.